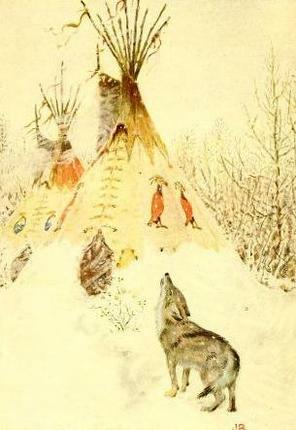 “Coyote the prairie wolf.” Illustration by John Rae, published in American Indian Fairy Tales by W.T. Larned (1921), P.F. Volland Company. Read Native American folk tales from North, Central and South America in collections from Zitkala-Ša, Cornelius Mathews, Cyrus MacMillan and more. Jump to full collection of Native American folk tales. About: When Coyote was a Man, or as Europeans might say, “Once Upon a Time,” Native American folk tales were an entirely oral tradition. Sacred and spiritual in nature, many stories were saved for specific seasons or evenings of the years. Contained in the narratives was often the basis for a tribe’s specific rituals and ceremonies; the stories still act to preserve ancestral history for Native Americans today, and to preserve their heritage and customs. Native American myths and folklore vary greatly across the great expanse of North, Central and South America; just as the sea turns into plains, turns into mountains, so the myths and deities evolve with the ever-changing landscape. If one thing connects all Native American folklore, it is that of the Great Spirit, and how spiritual forces can be felt and experienced in the physical world. The culture’s folk tales are known to symbolize seasons and nature as they honor our connection to the Earth. Creation myths abound within Native American folklore, as well as tales explaining how death came into the world. Migration myths are also a common theme, but most pervasive is the wily Trickster archetype. The Trickster is a consistent character within Native American folklore and mythology revealing himself in various animals or deities. Able to balance the vulgar with the sacred, the always mischievous Trickster tales were born from one’s own imagination and meant to delight and entertain rather than to pass down tribal traditions. With European expansion and influence, Native American folk tales and myths were gathered and preserved in compilations and anthologies, but the great tradition of oral storytelling remains a vivid and beautiful part of their culture, both inspiring art and revealing ideologies. Native American folklore includes North American and Canadian folk tales, with authors like Cornelius Matthews, Zitkala-Ša, and Cyrus MacMillan.